I'm up for Team 3, Week 1 in the May Round Robin at Swirlydoos. The theme is "White Space with a Twist". Our pages must be at least 40% devoid of photos, embellishments, journaling, etc. And the twist? The blank portion of our layouts will be full of mixed media: inks, mists, pastes, embossing powders, whatever strikes our fancy. There are some extra twists, of course, and the first is - in honor of Spring - to use some fun photos. We're to submit a true Swirly style page, with layering and distressing. The last twist is to dig into our embellishments - chipboards, fibers, flowers, etc. - but lightly. In Kim's words, "Embellish, but don't over embellish." While the idea of white space is right up my alley, the idea of filling it is not, but I do think that this page is a pretty accurate depiction of these two handsome guys - busy, messy and all over the place. I've used several sheets of pattern paper from 49 & Market's Heirloom Botanicals collection that were included in the November 2016 Market Street Kit from Swirlydoos. After prepping the Conservatory sheet by coating both sides with clear gesso, I applied crackle texture paste through a Tim Holtz stencil here and there around the page to create a random pattern. Next, I took out a few of my Prima background stamps and again at random, went all over the page to create some texture. 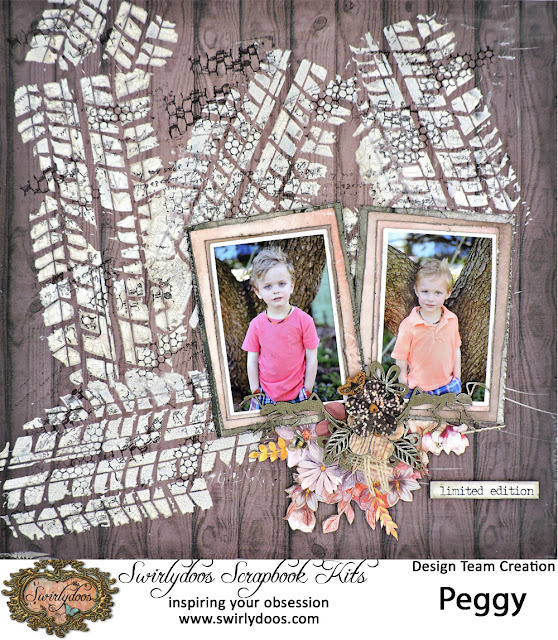 I cut some matting from the Harmony sheet and a scrap from Blue Fern Studio's Chesterville collection and lightly distressed the pieces and the photos before gluing them together with a bit of packaging in between to give some dimension. Once I had the photos placed as I wanted them, I added another layer of packaging underneath to allow room for some embellishments. Meanwhile, I fussy cut the flower image from the Harmony sheet and placed it under the photos. 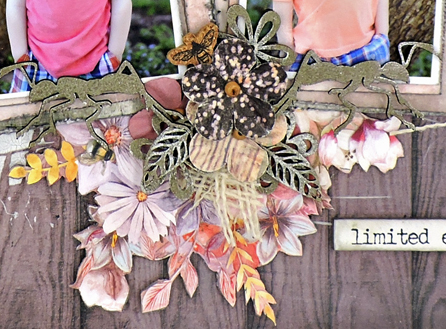 The mini blooms and wood icons (treated with embossing powder), along with the Tim Holtz Quote Chip that I used for the title are from the April Wildflower kit. Best of all are the heat embossed Creative Embellishments critters that were given to me by good friend Maggi Harding. Kim asked us to have fun and these ants are exactly that.